I feel only one thing rivals seeing and receiving the blessing of a living saint: being able to watch a crowd of people receive the same. By the grace of God I was able to make a pilgrimage to St. Anthony’s Monastery in Arizona. While there I had the great blessing of seeing Elder Ephraim three times. He does not currently see people one-on-one like he used to, but he comes out almost every morning to greet the pilgrims. The fathers bring him in a car so that the elder (who is close to 90 years of age) can sit while greeting the people. Although the elder has become physically weakened in his old age the strength of his spirit, which is full of life and love for the people, in no way has diminished. On the last day of our pilgrimage a significant crowd had gathered to wait for the elder as more pilgrims and nuns had arrived the day before. Just as on other days, the car pulled up so the people could receive the elder’s blessing. Each lined up to receive a cookie and an icon as they kissed the elder’s right hand. I have great love and reverence for Elder Ephraim, a person who works tirelessly for the Lord, a person who (I believe) will be able, at the end of his life, to say with Christ, “I have glorified thee on earth: I have finished the work which thou gavest me to do” (John 17:4). So, you can understand that receiving his blessing means a great deal to me. But seeing others receive his blessing gives me even more joy. You can tell a person is holy by the effect he or she has on other people. When you see the effect Elder Ephraim has on the people it’s impossible not to be reminded of St. Seraphim of Sarov’s famous quote: “Acquire the spirit of peace and a thousand around you will be saved”. This does not necessarily mean everyone will become a Christian, but it illustrates the depth of influence a person who has become holy has on his or her surrounding environment. One just needs to look at the monastery gardens to be convinced that the natural beauty found there cannot simply be attributed to the monks’ commitment to water and weed. Driving through the Sonoran Desert – mostly bleak and barren – the lushness of the monastery’s gardens seems even more incredible. How is such a contrast possible? Because holiness has produced such gardens. The acquisition of the Holy Spirit (Who is the ‘spirit of peace’) not only affects the spiritual but the physical atmosphere. And so, the colourful and lush grounds and gardens of the monastery are a physical manifestation of the spiritual reality that has taken place: that because of one man’s commitment to the will and love of God he too has “made the barren desert fertile” as the apolytikion for the monastery’s patron, St. Anthony, reads. I want to be like that man, to be like Elder Ephraim, who left the world he knew (the Holy Mountain) in order to labour in a foreign land (America) to share the sweetness of grace with his fellow man. Through his prayers I want to share the blessings I was given in Greece and elsewhere. But more than this I want to struggle to make the barren desert of my own heart fertile ground for the Holy Spirit so that myself and those around me may be saved. Once Saint Christopher [6th century] went to Jerusalem to worship at the Holy Sepulchre of the Lord and at the Life-Creating Cross. At the gateway of the church he beheld a monk not moving from the spot. Two ravens flew before his face. Saint Christopher discerned that these were demons, which held the monk back from entering the church. He asked the brother: “Why do you stand at the gate and not enter?” The brother answered: “Pardon me, Father, but within me struggle two thoughts. One says: go and venerate the Venerable Cross. The other says: don’t go in, make some excuse, and come to venerate the Cross another time.” Then Saint Christopher took the brother by the hand and led him into the church. The ravens immediately disappeared, and the brother venerated the Cross and the Holy Sepulchre. Saint Christopher told this story to someone who was distracted by his duties and neglected his prayers. For the first time in over a year Fr. John and I left the island and took a vacation. Vacation for us consists in two things: spending time with loved ones and visiting churches and monasteries (and for me, personally, it also means drinking as many Tim Horton’s coffees as I want:). We went to Kingston, Ontario to stay with my brother and sister-in-law. We had a wonderful time chatting and going for walks. We got to attend services at both of the Orthodox churches there: Vespers at St. Gregory of Nyssa OCA Church and Matins and Divine Liturgy at The Dormition of the Theotokos Greek Orthodox Church. Then we took a trip down to New York to visit the Holy Trinity Russian Orthodox Monastery and Seminary. Although Fr. Matthew was ordained there, both as a deacon and a priest, I was the only member of our family that wasn’t able to go. Thus, it was my first time visiting the beautiful, grace-filled monastery. We toured the monastery and seminary, venerated the icons and relics, and spent time with our good friend who is a monk there. On our return to Canada we headed for the Greek Orthodox Monastery of Panagia Parigoritissa. Getting to visit the monastery and see all the nuns feels like a family reunion. During our stay we helped sweep the courtyard, fold pamphlets and got to work in the vineyard – which was an especial blessing. The summer Fr. John was ordained a deacon we spent significant time there. We cherish our memories of all the years we’ve been visiting the monastery; we would often stop by the monastery when flying home from Greece as there is a direct flight from Montreal to Athens. There’s nothing like the physical and spiritual respite that comes from making holy pilgrimages; the ideal vacation in my opinion. Thank God for such oases! You come back home more peaceful, more centered, and ready to re-enter the daily battle of acquiring grace in the midst of work and worldly obligations. Today is a wonderful feast day of the above beautiful icon of the Dormition of the Theotokos that was brought from Greece to Ukraine by architects appointed by the Mother of God herself to build a church at the Kiev Caves. Having heard this account, everyone glorified God, and St Anthony said, “My children, we never left this place. 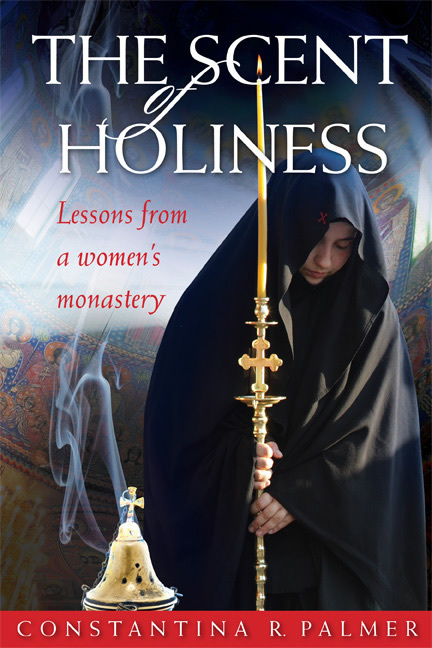 Those handsome youths summoning you were holy angels, and the Queen in Blachernae was the Most Holy Theotokos. As for those who appeared to be us, and the gold they gave you, the Lord only knows how He deigned to do this with His servants. Blessed be your arrival! 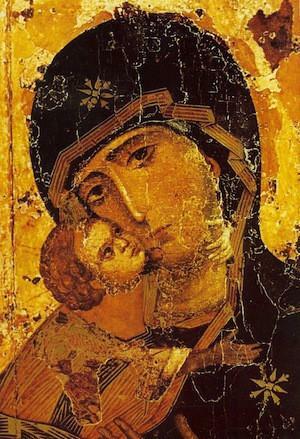 You are in good company: the venerable icon of the Lady.” For three days St Anthony prayed that the Lord would show him the place for the church. After the first night there was a dew throughout all the land, but it was dry on the holy spot. On the second morning throughout all the land it was dry, but on the holy spot it was wet with dew. On the third morning, they prayed and blessed the place, and measured the width and length of the church with a golden sash. (This sash had been brought long ago by the Varangian Shimon, who had a vision about the building of a church.) 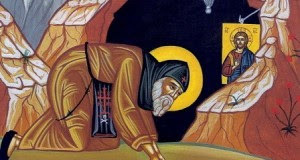 A bolt of lightning, falling from heaven by the prayer of St Anthony, indicated that this spot was pleasing to God. So the foundation of the church was laid. and glorify Christ Who is risen from the dead! The video is of the Holy Fire at Christ’s tomb, April 11, 2015. Who is as great as our God? Shout for Joy: Elder Paisios Has Been Canonized! Fr. John venerating the holy saint’s grave, 2012. According to the website of Romfea, the Synod of the Ecumenical Patriarchate has made the decision today, January 13, 2015, to enlist the monk Paisios the Athonite among the ranks of the saints. Glory to God! God is with us and is wonderful in His saints! 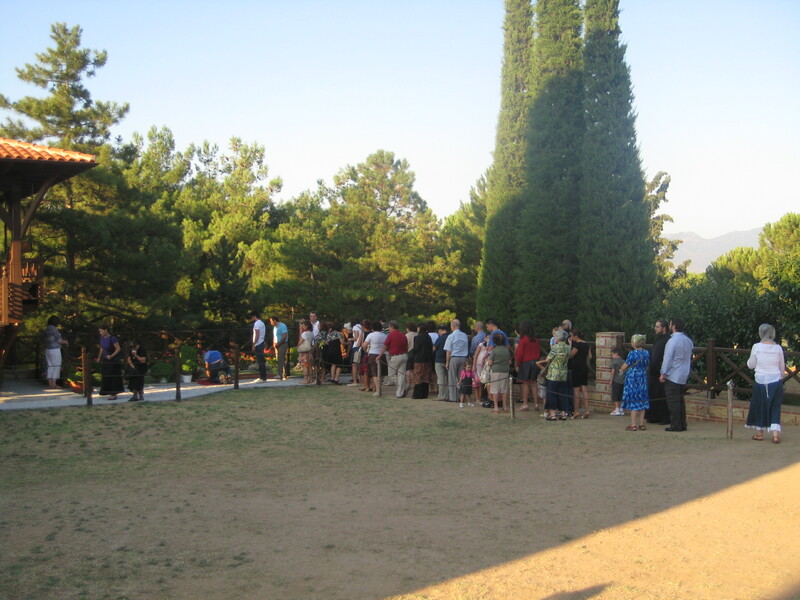 Although the website does not state what date St. Paisios’ feast day will be celebrated, he repose on July 12 and is buried at the Holy Monastery of St. John the Theologian in Souroti (outside Thessaloniki) where thousands of pilgrims visit his holy grave every July 12 (as well as throughout the year). So, my guess (but it is only a guess) is that his feast day will be July 12. But, I will update this post if I learn differently. May we have the much-needed prayers and blessing of the holy father among the saints, Paisios the Athonite! My family, waiting in line to venerate the saint’s grave on a typical Sunday evening after Vespers. The bells at the monastery in Souroti ringing out in celebration the day St. Paisios was canonized! (Thanks to a friend for sending me the link).